Sometimes you use an entire clause to describe a noun. This is called an adjective clause. 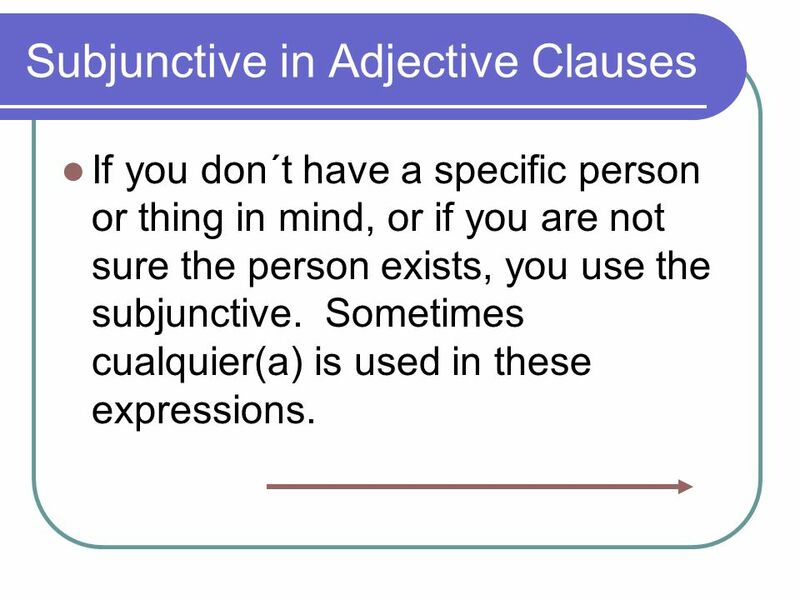 When you have a specific person or thing in mind, you use the indicative. Este libro tiene un artículo que habla sobre los mayas. 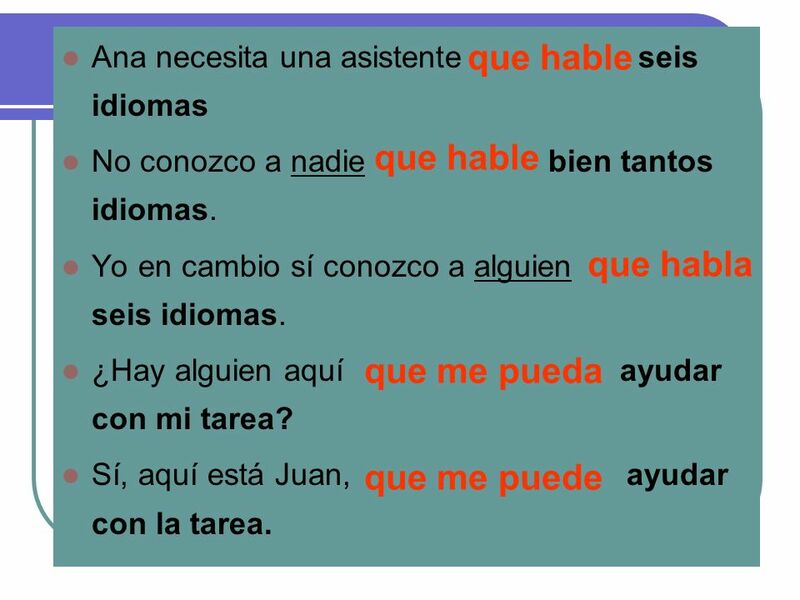 If you don´t have a specific person or thing in mind, or if you are not sure the person exists, you use the subjunctive. 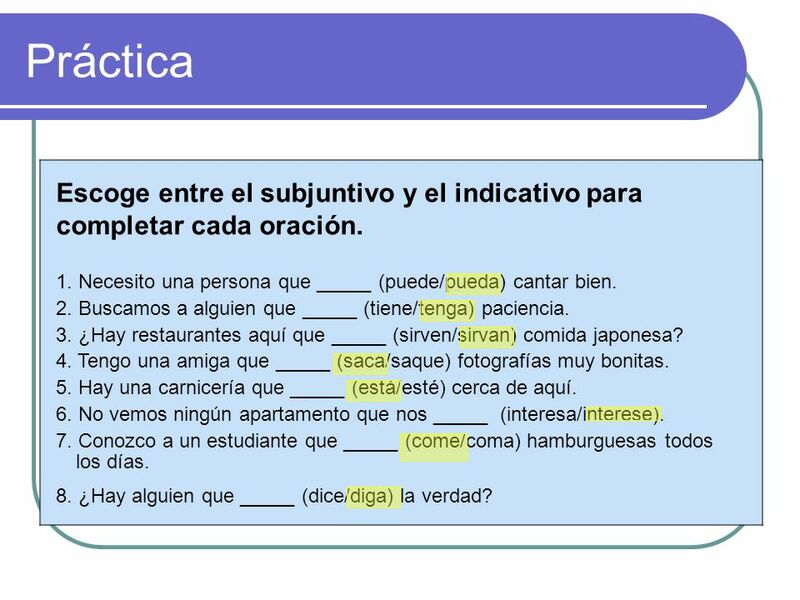 Sometimes cualquier(a) is used in these expressions. Busco un libro que tenga un artículo sobre los mayas. 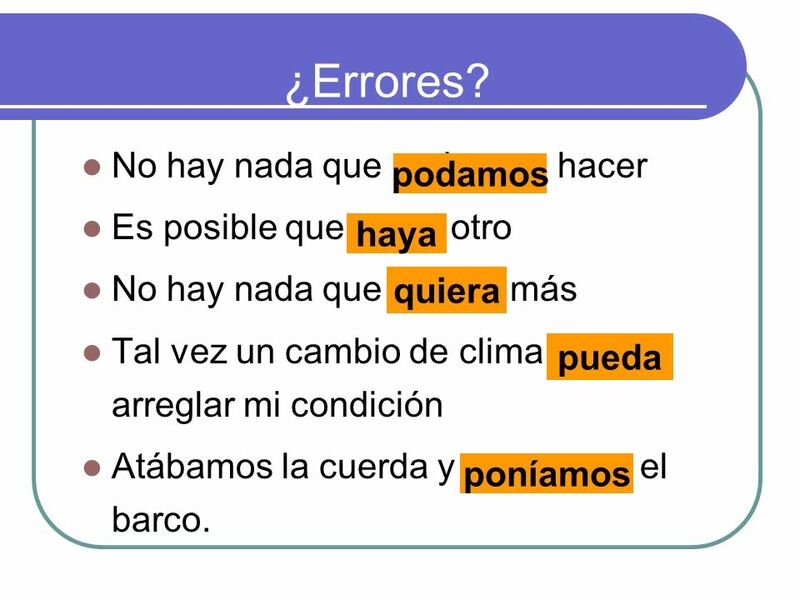 Escoge cualquier cosa que te guste. 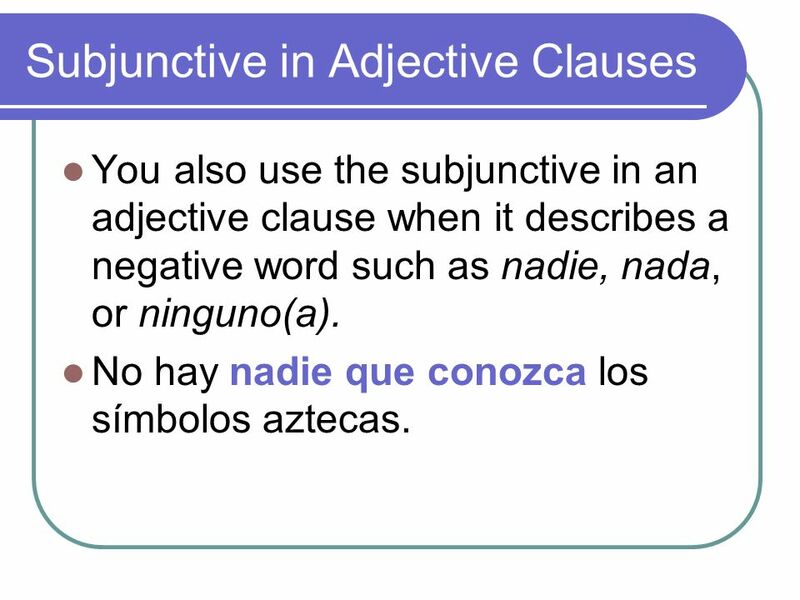 You also use the subjunctive in an adjective clause when it describes a negative word such as nadie, nada, or ninguno(a). No hay nadie que conozca los símbolos aztecas. 7 Antecedente ¡Atención! 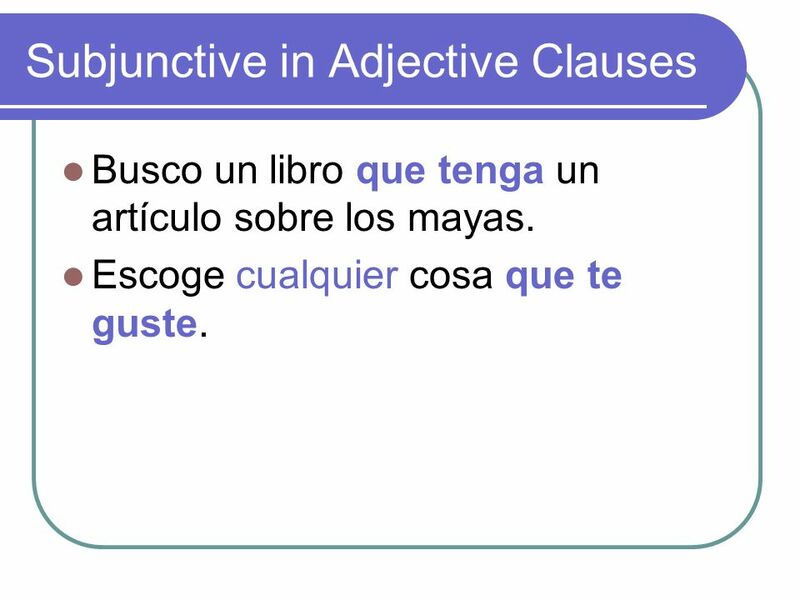 Adjective clauses are subordinate clauses that modify a noun or pronoun in the main clause of a sentence. 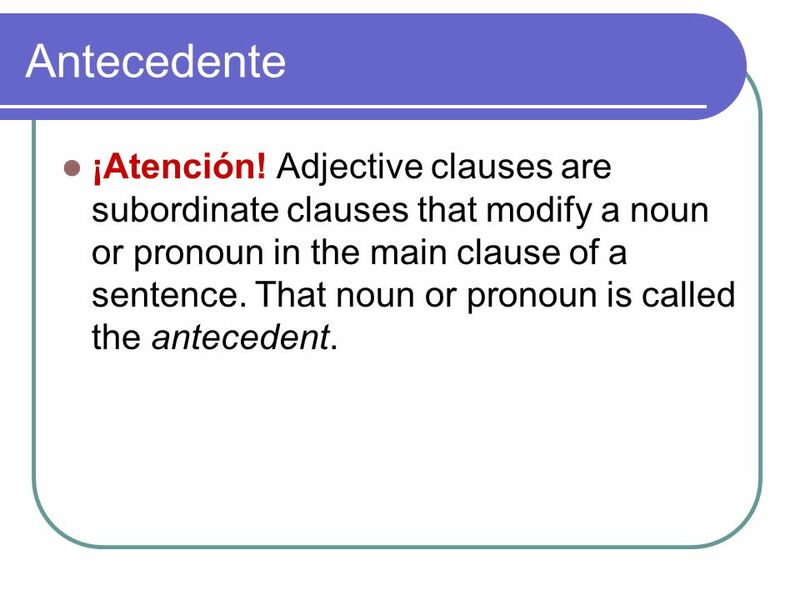 That noun or pronoun is called the antecedent. 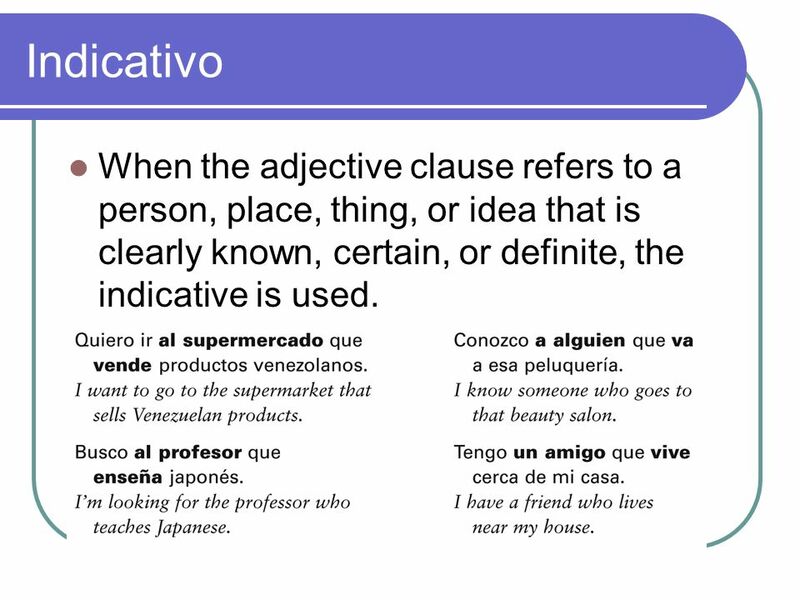 8 Indicativo When the adjective clause refers to a person, place, thing, or idea that is clearly known, certain, or definite, the indicative is used. 9 “a” personal The personal a is not used with direct objects that are hypothetical people. 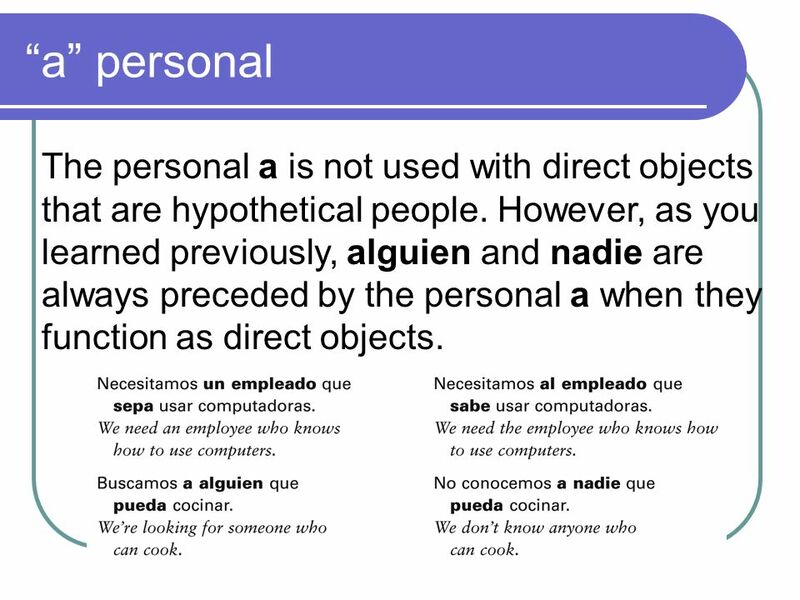 However, as you learned previously, alguien and nadie are always preceded by the personal a when they function as direct objects. 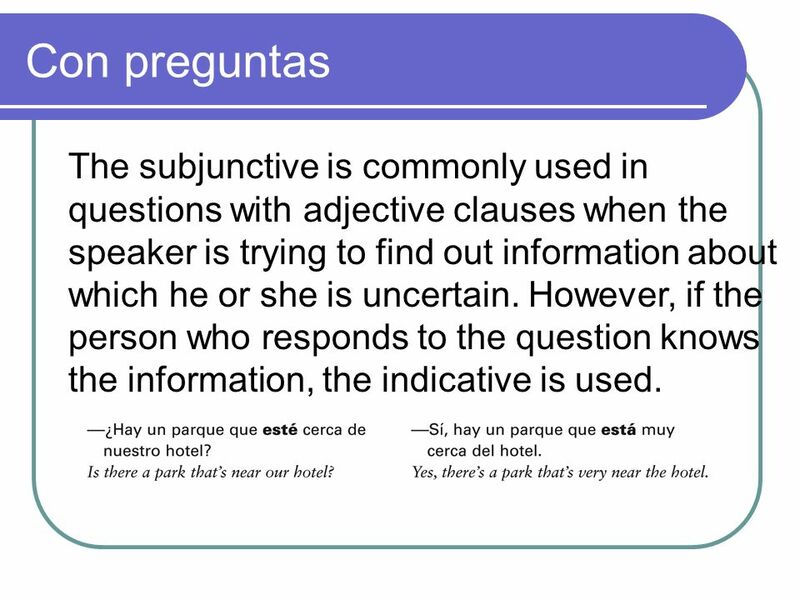 10 Con preguntas The subjunctive is commonly used in questions with adjective clauses when the speaker is trying to find out information about which he or she is uncertain. However, if the person who responds to the question knows the information, the indicative is used. 15 Práctica Escoge entre el subjuntivo y el indicativo para completar cada oración. 1. Necesito una persona que _____ (puede/pueda) cantar bien. 2. Buscamos a alguien que _____ (tiene/tenga) paciencia. 3. ¿Hay restaurantes aquí que _____ (sirven/sirvan) comida japonesa? 4. Tengo una amiga que _____ (saca/saque) fotografías muy bonitas. 5. Hay una carnicería que _____ (está/esté) cerca de aquí. 6. No vemos ningún apartamento que nos _____ (interesa/interese). 7. Conozco a un estudiante que _____ (come/coma) hamburguesas todos los días. 8. ¿Hay alguien que _____ (dice/diga) la verdad? 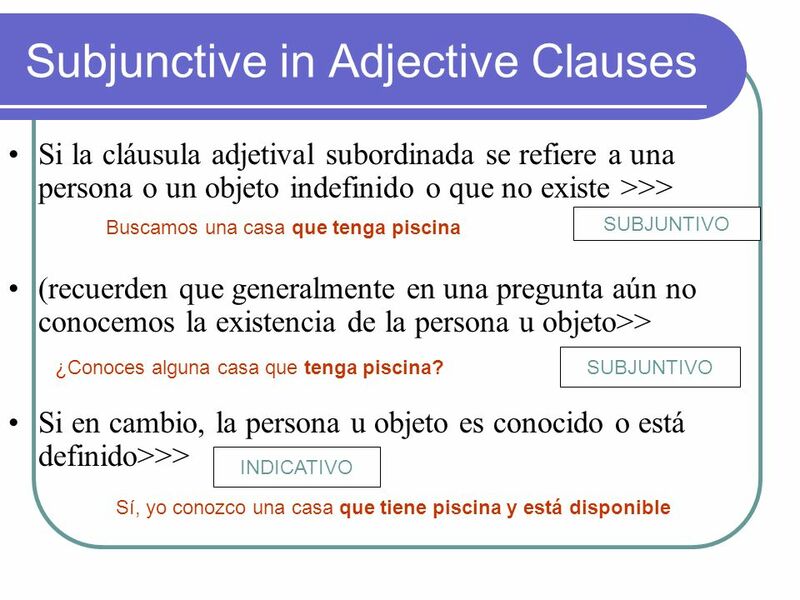 Descargar ppt "The Subjunctive in Adjective Clauses"
Subjunctive with the unknown or nonexistent. 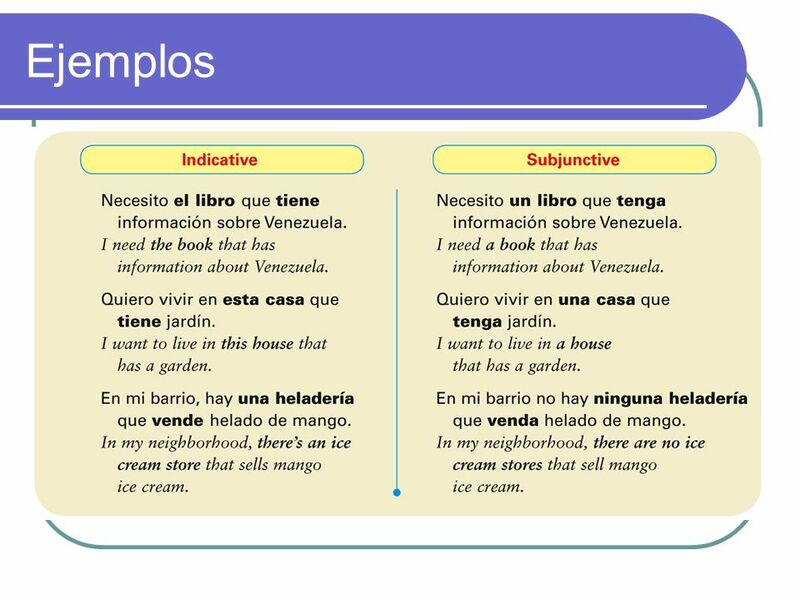 Subjunctive and Indefinite Entities Capítulo 13. 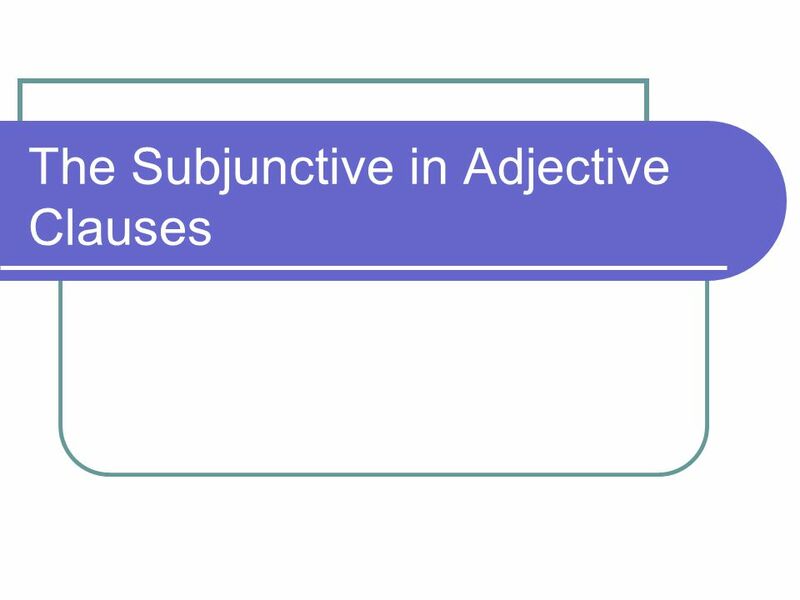 The subjunctive with indefinite entities Adjectival clauses are used when an idea cannot be expressed. 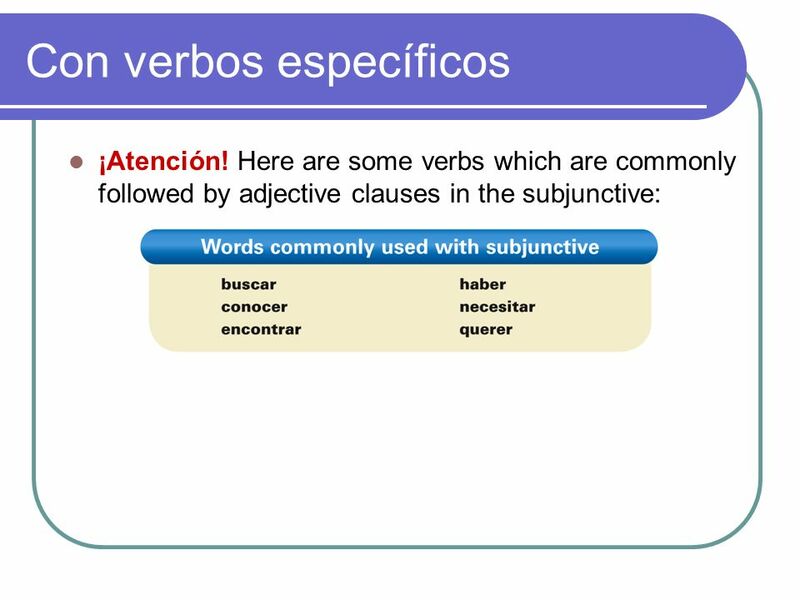 You will now learn how to use the subjunctive with verbs and expressions of will and influence. Copyright © 2008 Vista Higher Learning. All rights reserved. 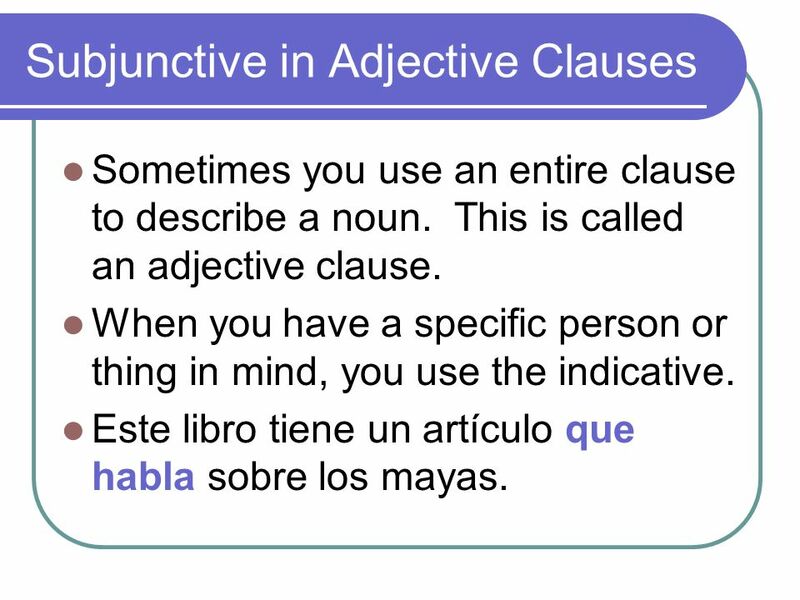 In both English and Spanish, relative pronouns are used to combine two sentences or clauses that share a common element, such as a noun or pronoun. Study.